Sparkling fruit flavour soft drink. What's the worst that could happen? This product is GMO free. This product is gluten free. This product is allergen free. This product is suitable for vegetarians/vegans.What's the Worst that can happen? 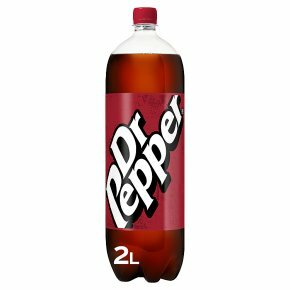 Dr Pepper's unique, sparkling blend of 23 fruit and spice flavours has been around for well over a century and it's still the same, with that distinctive flavour you just can't quite put your tongue on. Sparkling Fruit Flavour Soft Drink Serve cold for maximum refreshment. Store in a cool and dry place Please recycle.